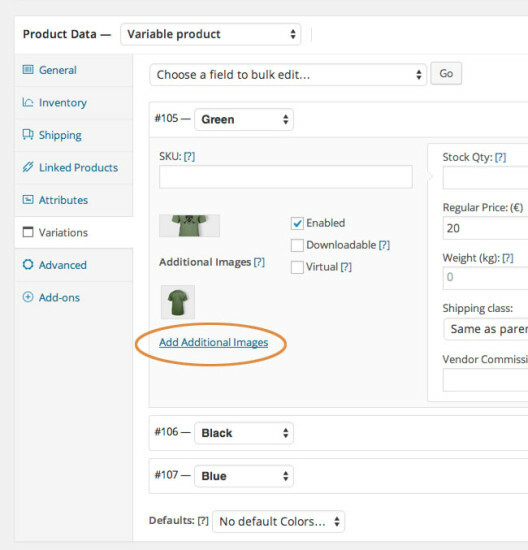 WooCommerce Additional Variation Images allows you to add additional gallery images per variation. More information at: Managing WooCommerce.com subscriptions. Find the Add Additional Images link and click. This link allows you to add any number of additional images for each variation. Add multiple images to a variation. Delete an image by clicking on it. Reorder images by clicking and dragging it to the desired location. Be sure to have a default set of gallery images for your product or else it won’t work. First check if it is a theme compatibility issue. Switch to a WordPress default theme such as the Twenty Twelve or Twenty Fifteen theme and re-test. If it does not work still, try disabling all plugins except WooCommerce and Additional Variation Images and test again. Read more about theme and plugin conflicts in our Self-Service Guide here. 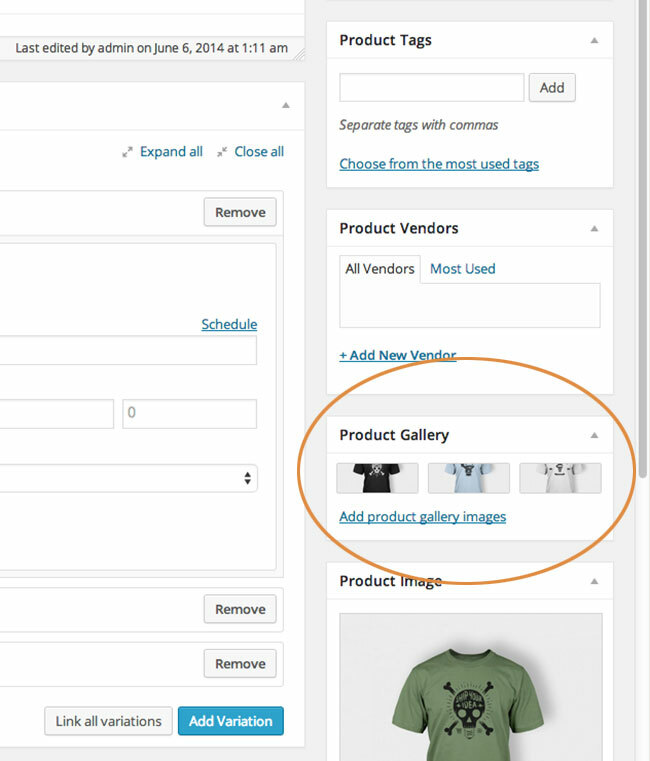 Be sure you’ve set up a product image gallery, for this extension to work. Themes that follow the default WooCommerce lightbox implementation will usually work with this plugin. However, some themes use an unorthodox method to add their own lightbox/slider, which breaks the hooks this plugin needs. Third-party theme authors can make this plugin work together by using the hooks and triggers available within the plugin. In addition, this plugin has incorporated its own lightbox so you can always choose to use it and turn off any lightbox options that are coming from your theme. Please consult with your theme author on how to disable the lightbox. While this plugin has incorporated as many hooks as possible for third-party themes to integrate and work together, sometimes it doesn’t work. For these cases, please contact Support and we’ll see if we can help. The best way to do it is to create one product with variation images and then export it first so you have a map structure to work with. To import additional variation images, you will need to add the column “meta:_wc_additional_variation_images”. For the value, enter a comma separated list of IDs of the images on your site. You can obtain these IDs when you bulk add the images to your site via the media library. apply_filters( ‘wc_additional_variation_images_get_first_image’, boolean ) – Used to determine whether the first variation image should be used. apply_filters( ‘wc_additional_variation_images_main_images_class’, string ) – Used to add additional classnames to the HTML container tag that wraps the main image of the current active variation. trigger( ‘wc_additional_variation_images_frontend_ajax_default_image_swap_callback’ ) – Callback functions to run before a variation image swap has already taken place. trigger( ‘wc_additional_variation_images_frontend_before_show_variation’ ) – A callback function to run when a variation change is triggered. trigger( ‘wc_additional_variation_images_frontend_ajax_response_callback’ ) – A callback function to run after a variation image swap has already taken place.